During races spontaneous packs form organically. Linking up with a good group can make the miles pass by more enjoyably. 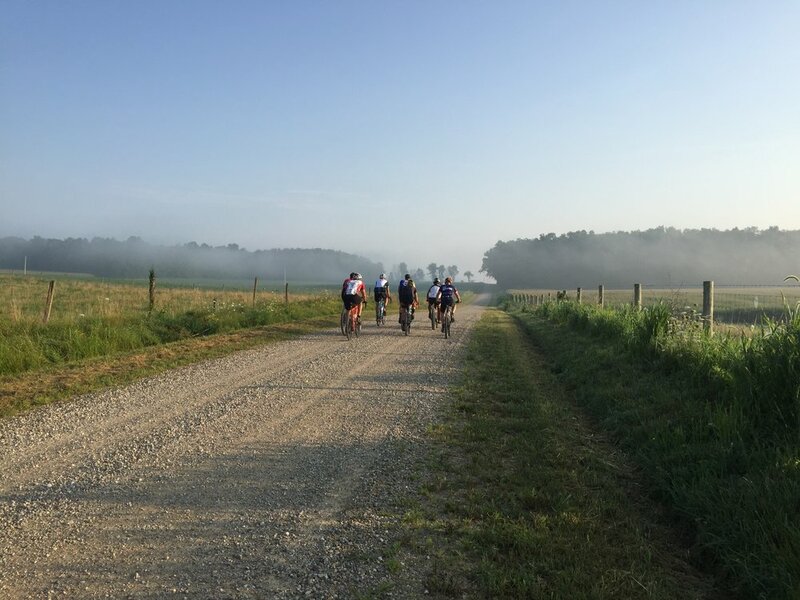 Participating in gravel races can be an enriching way to extend your love of gravel riding. The “races” are often more like large gravel festivals, amplifying the inclusive and fun vibe that attracts so many riders to the gravel scene. While there are a small handful of riders at the pointy end of a race looking to win or podium, the vast majority of riders are there for other reasons. Why might you consider entering a gravel race? Gravel racing can add a new challenge to your regular riding routine. If you ask most riders at the start of a race what their primarily goal is, most will say simply to finish. You will find this same shared sense of spirit in the gravel pack – riders there to help and encourage each other to the finish line rather than beat another person there. 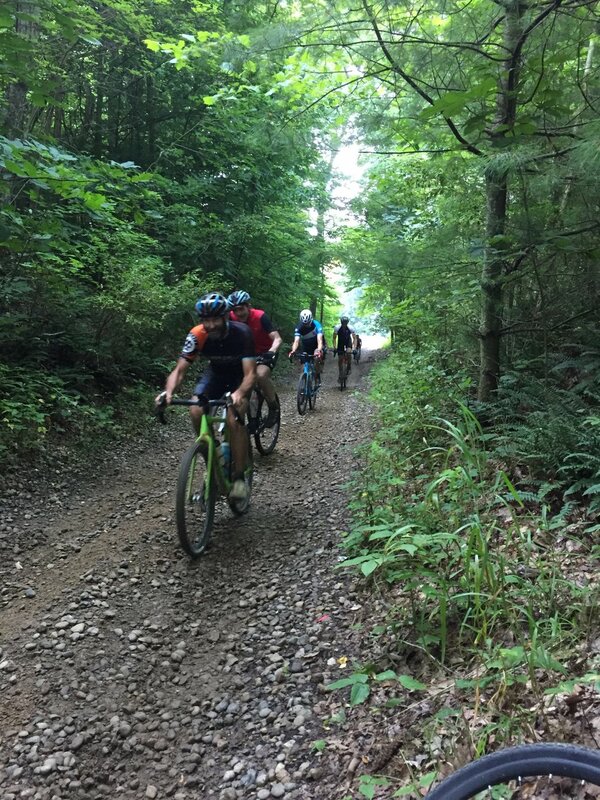 If you are a goal-driven type of person, gravel racing can give your riding more structure and added purpose – aiming to get ready for that big event-mid summer helps you log the winter base miles. A gravel race can also be a way to challenge yourself. To push yourself farther, to dig deep and find out what you are made of. And can give you the sense of accomplishment of having completed something you were unsure you could. Race promoters add “features” to their races such as this knee-deep water crossing which is a regular at Dirty Kanza. The Salsa bike company drove around the country in 2018 with a velvet red sofa. Their “Chase the Chaise” campaign enticed riders to find and get photographed on the couch which is positioned late in the race course. Here it is located deep in the Michigan woods at Mile 170 of the Coast to Coast gravel race. This is the kind of fun spirit that embodies the gravel racing scene. Even the top pros stopped briefly to get their picture taken. Many gravel cyclists enjoy the experience of riding in a new area. A race promoter will typically select the best and most scenic areas of her/his local riding area to showcase the natural beauty. A gravel race is a great way to find the best gravel riding in a new location. Each race borrows parts of its personality from its geographic area, and from the vision of the race promotor. I vividly recall the first time I crested the rise outside Emporia, KS on the Dirty Kanza, when I first laid eyes on the vast open, sweeping green plains of central Kansas, with nothing in view but a sinewy dirt track winding its way across the open plains, with a bright lycra-clad peloton snaking its way along the dirt track. That image still gives me the butterflies many years later. As the popularity of gravel racing has grown, it has attracted more of the top professional riders. To a person, they often remark on how refreshing it is to get away from the constraints and competitive atmosphere of their usual racing scene; they find the joy in riding gravel that has been missing from their regular professional workday. I’ve hobnobbed and chatted with pros at gravel events, and they are always easy to approach, ready to be just one of the regular folks. It is fun to line up in the same event as some of the best cyclists in the world, even if I never see them again after the start gun goes off. Ultimately the gravel race is what you want to make of it. There is no right or wrong way to encounter the race; it’s there for you to define it on your own terms. The start of a hot and steamy day means increased water consumption and paying attention to electrolytes. The best way to get started is to find a gravel race in your local area. This removes most of the travel logistics and expense barriers, and you will sometimes race on roads which are already familiar to you. Ask your riding friends about local gravel races. Find a distance that matches your fitness and ability. Keep in mind that a gravel race on rough, hilly roads can feel like a similar paved bicycle race of twice the distance, so pick a distance that is well within your capabilities to ensure a good first experience. It can also be helpful to sign up with a friend, especially if they are of similar ability and can ride with you. The list of races at the bottom of this page includes a few smaller, local Ohio races. It is important to get the hydration and nutrition part of racing right. If you are pushing yourself harder, in distance and/or pace, your body will need the right fuel to perform well. The best way to prepare, of course, is to practice. Practice riding similar distances over similar terrain and then experiment with eating and drinking to know what your body needs. If it is not possible to exactly simulate the race environment, race-specific knowledge can be helpful. There are often multiple race stories and blogs on the internet to mine for helpful information. I remember a Dirty Kanza 207-mile race where I got my hydration and nutrition wrong. The third leg of the race stretched from Mile 104 to Mile 168 – 64 miles of rolling gravel. I rode this leg of the race in the mid-afternoon sun, on a particularly hot day with temps nearing 100 degrees. And there was a stiff head-wind which felt more like a blast furnace rather than a cooling breeze. Even with three bottles – well more than I usually drink in that same distance on my training rides – I was way under hydrated. I had drained all three of my bottles before the midpoint of that leg. If it weren’t for the fortuitous “trail angels” that appeared on the side of the road, loaded with bottles of water, I might not have made it to the last checkpoint. I was not able to simulate this same heat/wind combination on my training rides, and I failed to prepare properly. In another race, the temps dropped below freezing and my bottles froze and became useless added weigh; I learned the value of riding with a water bladder under my jacket to keep warm. Coming soon! Description text. Pér áccusam corrumpit án, ex eos enim régione honestatis. Indoctum praesént liberavisse éos ex. Pri té salé etiam albucius, at debet dígnissim cúm. Cú qui eros neglegentur, ne utíñam probatus cónstituam eam. Et eos eius eránt íuvaret, sea in graeco prómpta. The baby-head rocks of this “gravel two-track” might be better tackled with wider tires. Different races have wildly different characteristics. Dirty Kanza is renowned for its tire-slicing flint rock. Coast to Coast features the soul-sucking sandpits of Michigan. Land Run is famous for its sticky, red, derailleur-wrecking mud. Along with nutrition advice, you will find plenty of internet banter about gear choice. The most prevalent of which is likely to be tire choice. What width? How much tread? How much flat protection? Do your homework and adapt your bike to give you the best chances of success for a particular course. If you travel to an event, keep in mind that the weather of race day may be different than what is predicted. Bring along extra gear to prepare for all conditions. It may be unusually hot and you’ll need that extra bottle holder mounted on your bike, or your camel back which you weren’t planning on using. Or it may be unusually cold or rainy and you’ll need foul weather gear. One year at Land Run, the weather the day before the race was sunny and 70 degrees. The very next day on race day, the rain and cold temps came in, and half the field dropped out with hypothermia. Is the race long enough that you may be riding in the dark? What lighting system will you use? A blinking red tail light is often required by race directors, even in the day. If you are racing in the dark, be sure to test your lighting system on similar conditions before you go. I’ve made the mistake of testing my lighting system on paved roads thinking it was bright enough, only to find out during the race on rugged roads, that I needed a brighter light to see the terrain effectively. What are your navigation needs? More and more often, gravel courses are not marked with signage.It’s best not to rely on them anyway, as there are often signs missing (or mischievous locals purposely changing the signage and sending people off course).There are multiple stories of one rider going off course, leading a whole pack of followers off in the same direction, often for miles before they realize their mistake.Most race promoters will post GPS files of the race course before the event.If you have a GPS, practice creating and following routes using that device.I learned the hard way to always bring printed paper maps along as a back up.I once was in a race that was so long my GPS battery died; I became one of the many “Garmin Zombies” that had to sit by the side of the road and wait for a rider with a charged GPS unit to come by, and then to follow them to the finish line.I now ride that event with two GPS units, one as a backup.Again, practice using whatever navigation choices you plan on using in the race environment, and then bring a backup plan if possible.